St. Augustine is a grass variety hardy in the southern United States in USDA growing zones 8 through 11. The grass has wide blades with wiry stems that withstand heavy foot traffic. Installing sod is the best method of planting St. Augustine grass in early spring since this variety spreads through above-ground runners. St. Augustine grass prefers full-sun locations but tolerates shade if watered sufficiently. Test the soil pH to verify it is 5.0 to 8.5. St. Augustine grass grows well in acidic and alkaline soils, as long as the pH is below 8.5. Till the lawn area soil to a depth of 6 inches with a tiller. Add ground rock sulfur to the soil according to the package instructions for the soil type before tilling if the pH is higher than 8.5. Rake the area to remove weeds and stones and smooth the soil. Apply 1/2 lb. of 1-2-1 lawn starter fertilizer to the soil surface with a broadcast spreader for every 1,000 square feet of lawn. Roll the soil with a lawn roller filled with water for weight to pack the soil and fertilizer. Moisten the soil with approximately 1/4 inch of water. Install the sod rolls across the lawn area, starting in the longest straight section. Stagger the sod rolls in a brickwork fashion so the short edges do not line up. 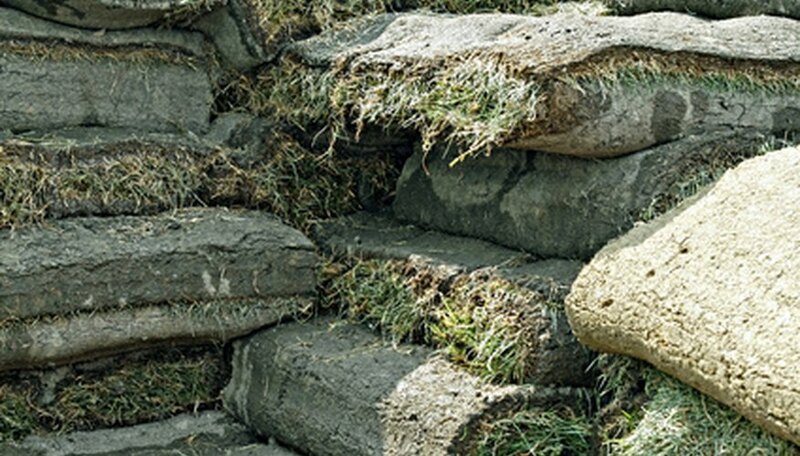 Pack the sod strips close together to limit gaps between the sections. Pack topsoil into all holes and gaps once the sod installation is complete. Roll the lawn with a lawn roller half full of water for weight. Rolling the sod will push the roots into the ground to speed root establishment. Water newly installed sod immediately to a soil depth of 6 inches. Continue to water the lawn to a depth of 6 inches each day for the first four weeks. Water the established St. Augustine sod grass when the blades being to wilt. Apply a high-nitrogen fertilizer once a month during the growing season at a rate of 1 lb. of fertilizer for each 1,000 square feet to an established St. Augustine sod lawn. Lawn rollers are available at garden supply stores. St. Augustine grass with an iron deficiency will present yellow blades. Apply iron sulfate to troubleshoot the problem.